The place now known as Blandford Nature Center began as Collins Woods, part of the Collins family farm. It was the place Dr. Mary Jane Dockeray explored as a child and nurtured her love of the outdoors. In time, Victor Blandford purchased the farm from the Collins family and began to sell it off as lots. 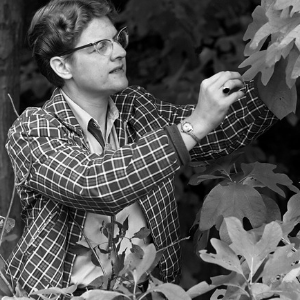 In 1949, Mary Jane began working for the Grand Rapids Public Museum as a nature lecturer. 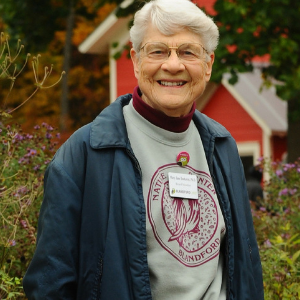 Eventually, Mary Jane convinced the Blandford family to donate 17 acres to the museum for the development of a nature center, and she became the curator. In 1965, the Museum Association helped seek the funds necessary for building a visitor center, which opened in 1968. Over time, Mary Jane found state dollars to purchase more land, bringing the Grand Rapids city-owned land to a current total of 264 acres with our recent acquisition of the former Highlands golf course with the Land Conservancy of West Michigan. In 2003, Blandford seceded from the Grand Rapids Public Museum and entered its early years. It was managed by Grand Rapids Public Schools for four years and in 2007, merged with Mixed Greens. In 2009, the Wege Foundation provided five years of funding for an Executive Director to stabilize the organization and rebuild it as an asset for the community. Blandford Nature Center has been a thriving independent, charitable 501(c)(3) nonprofit ever since. Join our efforts to empower and engage our community through enriching experiences in nature. Purchase a membership to explore nature year-round for FREE and enjoy other benefits. If you have questions, please contact the Development team at development@blandfordnaturecenter.org or 616-735-6240.